McLaren take on Ferrari | What Car? Lewis Hamilton's Formula 1 team, McLaren, has announced plans to take on arch-rival Ferrari in the showroom as well as on the racetrack. The Woking-based company will launch a mid-engined, high-performance two-seater, currently called P11, and targeted at Ferrari's F430 and the Lamborghini Gallardo, in 2011. It will be the first of 'a range of models, based on ground-breaking architecture and materials and offering the best in practicality and safety', says Antony Sheriff, the managing director of the newly independent McLaren Automotive. He also promised it would set new environmental standards for the high-performance class by using 'exotic technologies' that will eventually filter down to less expensive cars. 'In terms of technology, this car will be fundamentally different to what's already out there. It will be exclusive, and accordingly priced,' he added. Twenty-four prototypes have already been built as part of a programme that has been running for the past two years, but technical details are being kept under wraps until later this year. McLaren believes the P11's launch will coincide with a recovery in world car markets, but is playing safe by basing its business plan on the 2003 sales figures for exotica. It expects to sell 1000 cars in 2011, and up to 4000 by 2014-15, when its full range will be on stream. 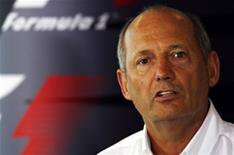 McLaren Automotive is being hived off from the Formula 1 division to become fully independent as part of the expansion plan, and former boss Ron Dennis has severed his ties with Hamilton's team to run the company. He is seeking 250 million of outside investment, which will allow the automotive division to operate debt-free. The project will create up to 800 jobs at McLaren at a new production facility likely to be on the Woking site, with further new jobs at supplier companies. McLaren first started building road cars with the iconic F1 still regarded as a milestone supercar between 1993 and 1998. Since 2003, it has built the Mercedes SLR McLaren for Daimler, first as a coupe and latterly as a roadster, and the limited-edition Stirling Moss. Production of that range is due to cease at the end of this year.